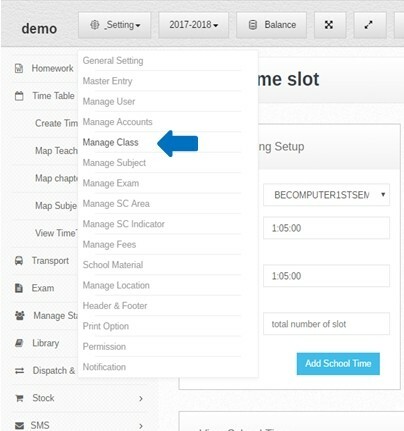 Step:-1 Time Table Management software Please click setting option then select manage class option. 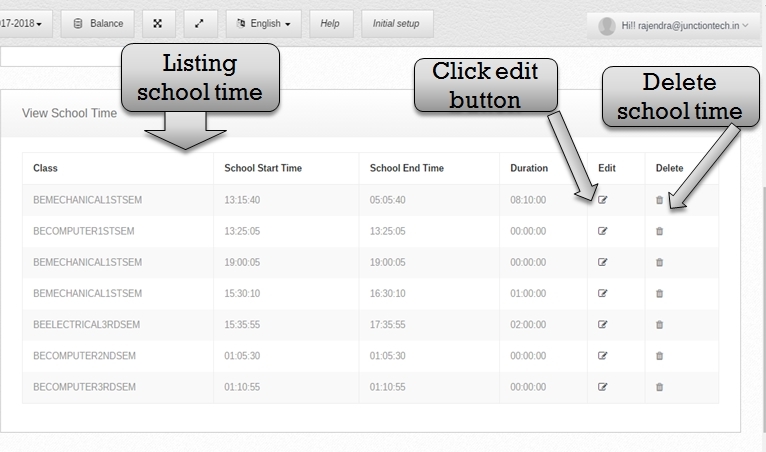 This module allows the user to keep records of timetables for all the classes in the school. This type of time table is very important to manage the burden of homework which is assigned to students. This time-table will also ensure equal attention to home-work in all the subjects. Step:- 2 Time Table Management software create class and section. 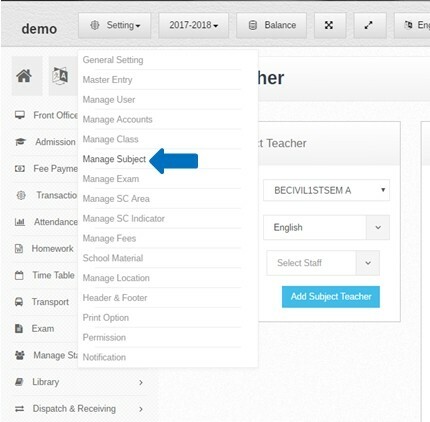 Now you have to select manage class option then open manage class & section form . please enter the class name and click add button class create successfully. Step:- 3 Listing all class if in case you have to change class name please click edit button then open previous class name . enter new class the name then click add button new class name save successfully . 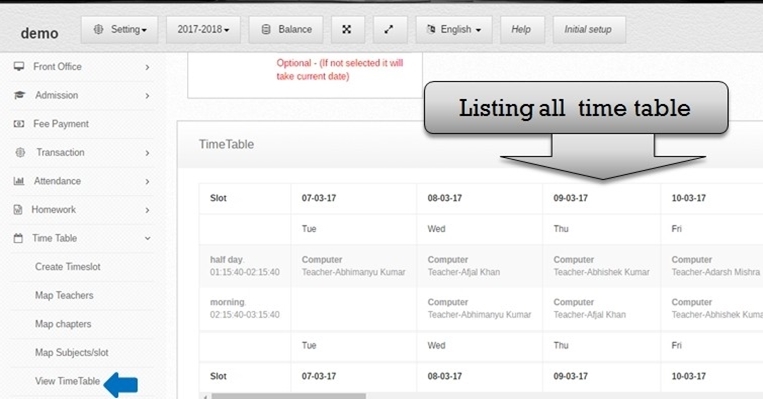 Step:- 4 You have to create time table in Time Table Management software. please click create timeslot option then open create time slot form. 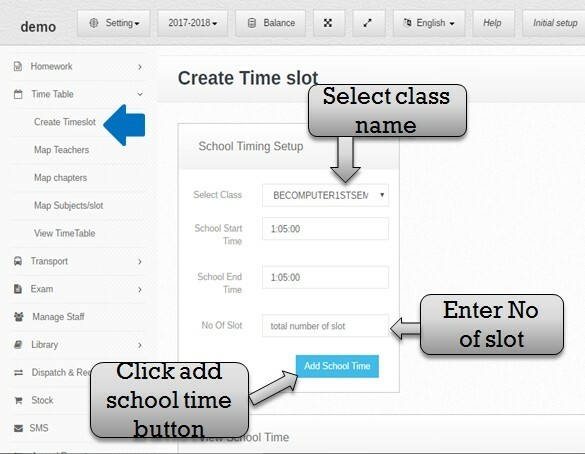 user select class name, school start time, school end time and enter NO of Slot then click add school time button. Step:- 5 Click add school time button then open slot timing setup form please enter slot Name and enter slot Duration time . click add time slot button then time slot create successfully you have to delete time slot so please click delete button then time slot delete successfully. 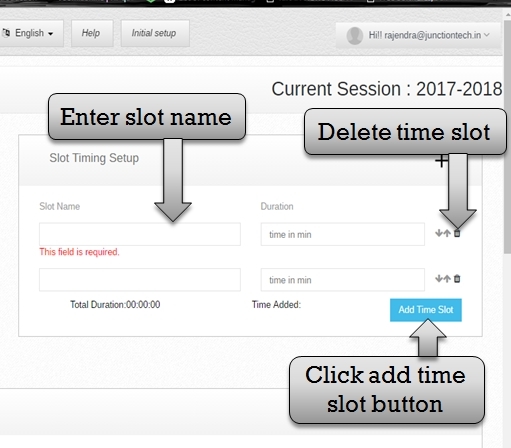 Step:- 6 Listing all time table slot showing in Time Table Management software, If in case you have to change the class start time and end time. so please click the edit button then change the class start time and end time, you had to delete time slot please click the delete button. Step:- 7 School time slot create successfully now you have to create subject please click the Setting button and select manage subject option. Step:- 8 You have to create subject behalf on class. so please enter the subject name, Abbreviation name, and select class name. 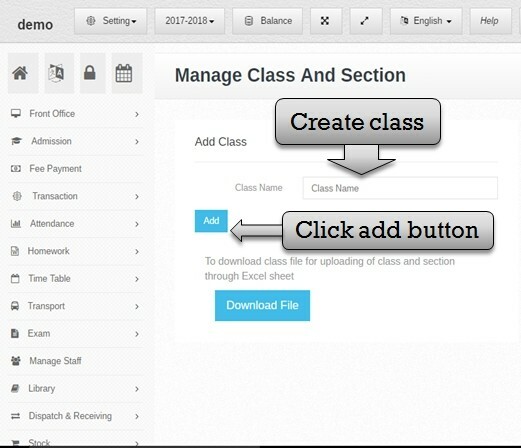 now you have to click add button then subject create successfully behalf on the class name. Step:- 9 Listing all subject name behalf on a class name if in case you have to change subject name please click edit button then open previous subject name enter the new subject name then click add button new subject enter successfully. search subject name please enter the subject name in search box and press enter. 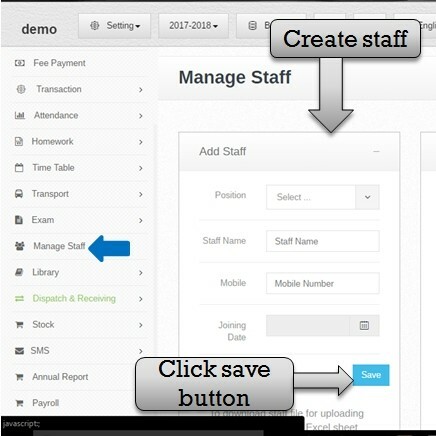 Step:-10 Subject create successfully then you have to create staff so please click manage staff option then open add staff form please select staff position, staff name, mobile number and joining date then click save button staff create successfully. 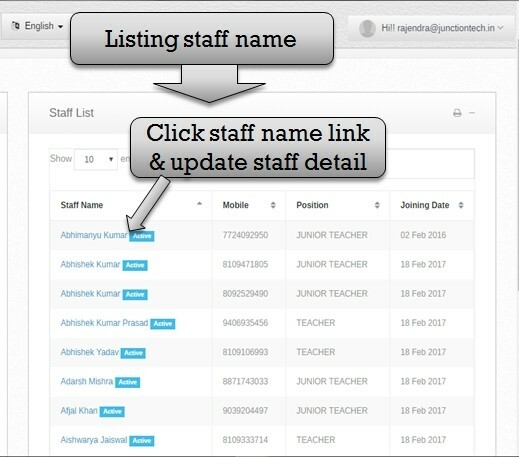 Step:-11 Listing all staff name list now you have to change staff detail please click staff name link then open previous staff detail. Step:-12 You have to change staff information so please enter new staff name and enter staff qualification then upload staff document. you have to select status check box then staff status active . click save button staff update information successfully save . Step:-13 You have to create subject teacher behalf on a class. 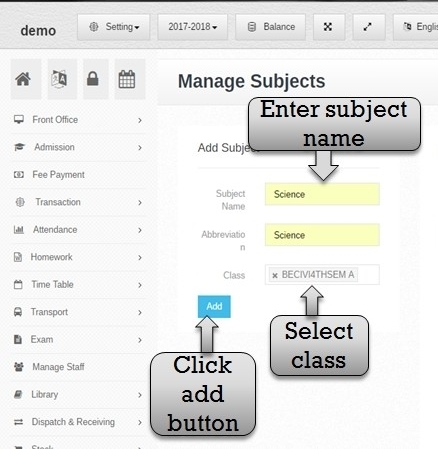 so please select class name , subject name and staff name then click add subject teacher button . subject teacher create successfully . Step:-14 Listing all subject teacher name. now you have to change subject teacher name please click edit button then open previous subject teacher detail . 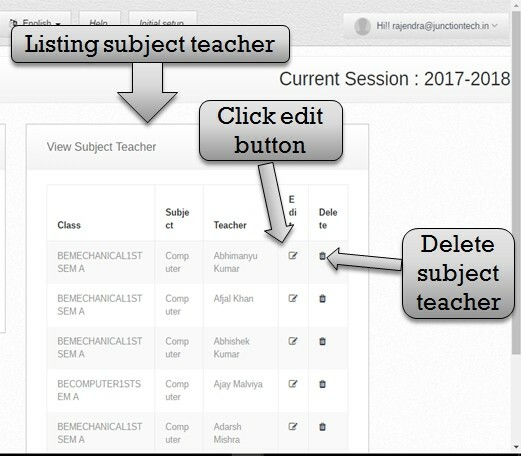 now you have to select new subject teacher and class name then click add button . new subject teacher detail successfully save then delete any subject teacher please click delete button . Step:-15 You have to create subject chapter name . please select map chapters option then open add chapter & topic form. you have to select class name and subject name then open chapter & topic form . 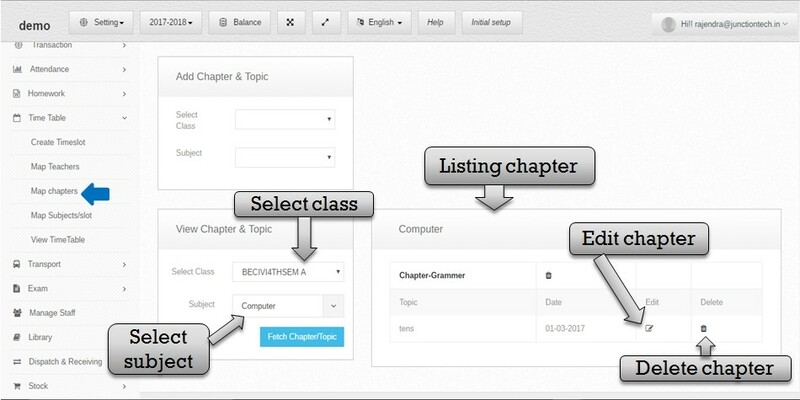 please enter chapter name , topic name and select date then click add chapter button . chapter create successfully . Step:-16 Now you have to view chapter and topic name . please select class name and subject name then click fetch chapter/topic button. listing chapter and topic name now you have to change chapter name and topic name please click edit button then open previous chapter and topic information . now enter new chapter and topic name . then click add button and information successfully update . now you have to delete chapter please click delete button . 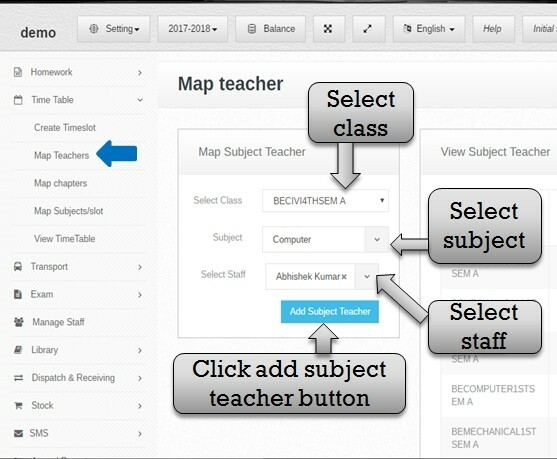 Step:-17 Select map subjects slot option open map subject slot form please select the class name, subject name, slot and select days then click add subject slot button. subject slot successfully add . 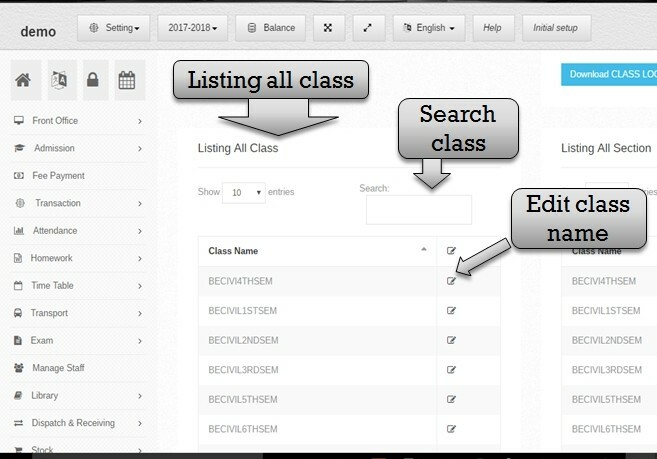 now you have to view subject slot please select class name then click fetch subject button . Step:-18 Listing all view mapped subject slot now you have to change any subject slot information . please click edit button then open previous subject slot detail. 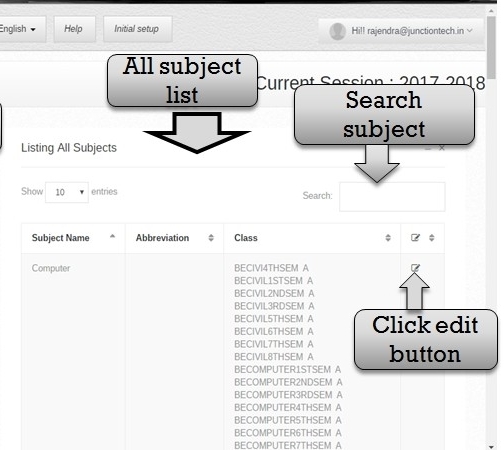 Enter new subject slot information and click add button subject slot update successfully save and delete any subject slot information now you have to click the delete button. Step:-19 View all time table behalf of a class . 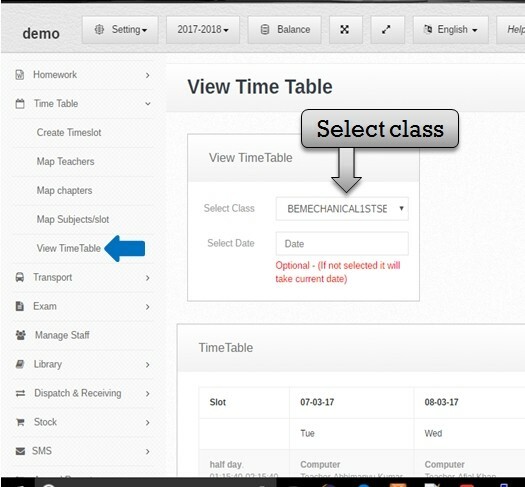 select view time table option in view time table option you have to select class name and date (optional).